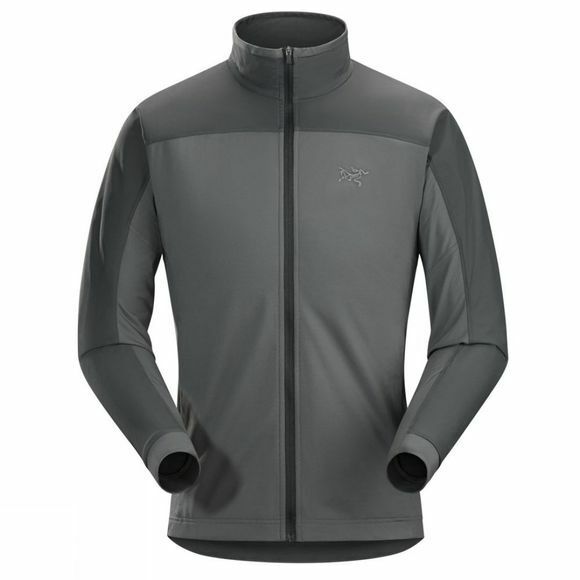 Made from Torrent, a soft, stretchy, breathable lightweight fleece, and reinforced with water resistant Socora fabric on the arms and shoulders, the versatile Arc'teryx Men's Stradium Jacket is designed for mountain training and high output activities in cooler weather, and provides warmth during post workout cool down periods. Torrent is used in the body to provide thermal comfort and moisture management. Socora panels on the arms and shoulders are specifically placed to provide airflow, weather resistance and abrasion resistance. A Polygiene treatment helps control odour. Created for fast-paced activities like trail running, hiking or Nordic skiing, the Arc'teryx Men's Stradium Jacket is built to move. The regular fit accommodates light layers, but is streamlined enough to keep close to your body to maximise the Torrent fabric's moisture management properties. Functional articulation and gusseted underarms combine with fabric's stretch to maximise freedom of movement. The tall collar provides warmth, and the locking slider on the front zip prevents inadvertent opening.